We are going to have quite the tilt here. It’s flagship vs. flagship. A real head-to-head battle for Android tablet supremacy. We will go with rumored specs for the Galaxy S2 8.0 at this point, but we will also update as official details come out. What’s in a name you ask? Well just on the naming schemes alone, it’s quite clear who Asus is taking aim at. Both are S tablet and both will be taking the 8.0 or 8-inch size. Both feature a 4:3 aspect ratio. Both tablets will share the same screen resolution. As with the ZenPad S 8.0, the Galaxy Tab S2 8.0 appears to have a microSD slot for extra and cheap storage expansion. We understand right now that the Galaxy Tab S2 8.0 is going to have a max of 32GB storage, and if true, then Asus beats Samsung because the ZenPad Z580CA has a 64GB model. RAM wise, the Galaxy S2 8.0 has 3GB and the Asus Z580CA beats that with 4GB. Processor wise, both tablets here are have the fastest out there right now. Officially the Galaxy Tab S2 8.0 has a 1.9GHz processor which is not as fast as the ZenPad S 8.0 which clocks in at 2.3GHz (or 1.8GHz if alternate configuration). Camera wise, it’s a challenge for Asus to beat Samsung. The Samsung Galaxy Tab S2 8.0 sports a 8MP rear and a 2.1MP front camera. Megapixel wise it appears to be a draw for the rear, but Samsung has a strong track record when it comes to great cameras on their mobile devices. We will need to wait for some better reviews and side-by-side photo comparisons. Photos from a tablet? Nice, but certainly not a primary criteria for buying one of these tablets over the other. The front camera on the ZenPad S 8.0 is 5MP which in theory should out perform the 2.1MP front camera of the Galaxy Tab S2. Let’s look at the actual build now. Size wise, these are both 8-inch tablets. The Samsung Galaxy Tab S2 8.0 has the following specs: 198.6 × 134.8 × 5.6 mm and the ZenPad has the following specs: 203.2 x 134.5 x 6.6 mm. On this basis, the Galaxy Tab S2 8.0 beats out the ZenPad S 8.0 in terms of being smaller (less bezel) and also being quite a bit thinner. We don’t want to downplay thinness, but it’s important to consider cases and covers and what role that will end up playing in how thick or thin your tablet becomes. In this comparison, it’s quite possible that the thinness is a result of Asus placing a pair of front facing stereo speakers. Thus, there is a compromise and as a shopper, you decide if being thinner is more important to you than front facing speakers. Weight wise, the Samsung Galaxy Tab S2 8.0 is 265g in comparison to the Asus ZenPad S 8.0 (Z580CA) which weighs 290g. Samsung certainly has Asus beat in being lighter and by quite a good margin. Battery life is going to be a heated battle (no pun intended). What we do know is that the ZenPad S 8.0 sports a 4,000 mAh battery and the Galaxy Tab S2 has a 4,000 mAh battery battery. Thus the battery life in theory should be close to a draw. Price comparison? We can only go with track record. How has Asus in the past compared with Samsung? Looking at the recent Zenfone vs. Galaxy S6 pricing, Asus has Samsung beat by a big margin. We would expect Asus to continue this strategy of being a much lower priced product in hopes of gaining some market share. We don’t have prices right now on either device, so we will have to update in the near future. Special Features vs. Comparison: We don’t want to come of being fanboys. However, when you look at the extras? 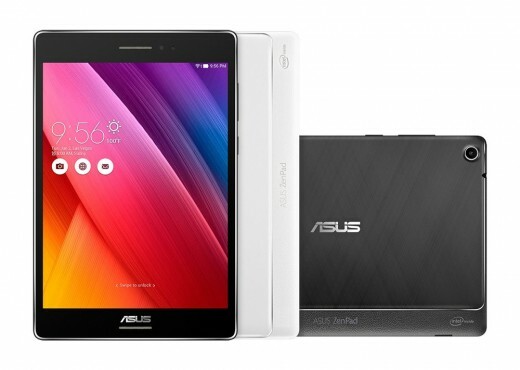 There is a clear winner and it’s the Asus ZenPad S 8.0 (Z580CA). We say this for a couple reason. First, the Z Stylus means pen input. It means a substantial added value for what you can do with the tablet. You can question stylus pen input on touch devices, but there is value. If you have kids, you know the educational value in something like this. Second, and this is a big deal, the ZenPad S 8.0 features two front facing stereo speakers. When you consider consuming media, speakers are a core feature. It does appear that Samsung put their design resources into creating thin and light, and with that there has to be some sacrifice. Front facing speakers are a big deal. In terms of what Samsung has over Asus in this tablet comparison? Finger scanner is one feature that the Galaxy Tab S2 has over the Z580CA. You cannot get a 4G LTE version of the Z580CA, however the Samsung Galaxy Tab S2 8.0 has a mobile connected model available. Certainly build quality is substantial. Screen wise, in terms of brightness, Samsung should reign supreme. However outside of the design, there isn’t a big number of added features in the Galaxy Tab S2 8.0 tablet. To become the world’s thinnest tablet is impressive, but is that a key feature for making a purchase? We almost forgot to mention the USB Type-C connection on the ZenPad S 8.0. So this is a third special feature that Asus has over Samsung. In the official specs of the Tab S2 8.0, nowhere has it been mentioned about having a Type-C connection port. Conclusion: When you start looking at the Asus flagship tablet, you realize what a formidable product it is. When we look at the competition, in this case the upcoming Galaxy Tab S2 8.0, it becomes more evident just how good the Asus Z580CA really is. On a spec-by-spec comparison, Asus simply has more. Likely it will be more for less (cost) to the consumer. Even if both these tablets come in at around the same price, which one offers more features? The ZenPad S does clearly. Brand name? Samsung has an advantage. Reputation wise? Samsung has an advantage. However, Asus is proving that when they put everything into a “hero” product, they are tough to match. I completely agree with your review. I just bought an ASUS ZenPad 8 yesterday. Here in the Philippines it cost P16,995.00. It’s way cheaper than Samsung Tab S2 which cost P24,995.00. ASUS’ UI is clear & clean, just like Samsung Tab S2. Why buy Samsung Tab S2 when ASUS ZenPad 8 has a faster processor, higher RAM, front speakers & higher front camera pixels. And most of all – lower price. Zenpad’s screen and color is disappointing, Samsung looks better in this case. We could also say the iPad has a better looking screen and color, however, it’s not sensible to compare a $500 device to a $300 device and expect equality. I would suspect that 95% of the public wouldn’t have an issue with it. i’m hearing that these usb type – c cords are frying some tablets . what have you heard about this problem? Hi, sorry for the late reply. This is actually something I’ve never heard of. If you have a link or article I would be interested in looking into this. Thanks. I have had both tablets for quite some time (got the Galaxy Tab S2 just after the last major price drop about a year ago, and the ZenPad Z580CA just after its release), and both are excellent tablets. However, recently, I’ve been strongly considering getting rid of one 8″ tablet, and upgrading to a 10″ tablet (with the Galaxy Tab S3 being a strong contender), so I’ve been trying to decide which – Asus ZenPad S, or Samsung Tab S2 – to get rid of. My initial instinct was to sell the 8″ Tab S2…but, upon running numerous benchmarks, I’m SERIOUSLY questioning that. I won’t list individual benchmark results (would take WAY too much space), but I WILL state that the ZenPad Z580CA posted results considerably better than the Tab S2. While most results were approximately 50% better, a few were as low as 25% better, and a few were as high as double. It’s a shame (VERY sad) that, as slow as Samsung typically is in updating software/firmware for their products, Asus has…at least in regards to the ZenPad S 8.0 tablets…been considerably slower. It is this problem for which I was initially going to get rid of the ZenPad S.
I know I’m a bit late to this forum (as the last comment is almost 10 months old), but, just by chance, does anyone out there also have both tablets, and, if so, what are your thoughts in regards to which would be the better choice to keep?